On my list of the most underrated cuts of beef, top sirloin takes the cake. Before my critics get up in arms, let me clarify: I completely understand that cuts like beef cheeks and oyster steaks are wildly delicious and obviously underrated. The reason top sirloin wins the trophy for the most underrated cut of beef is because it’s both well known and under-consumed. It’s like Wilbur the pig at the county fair: it needs a huge sign hanging above it for people to believe it’s any good. 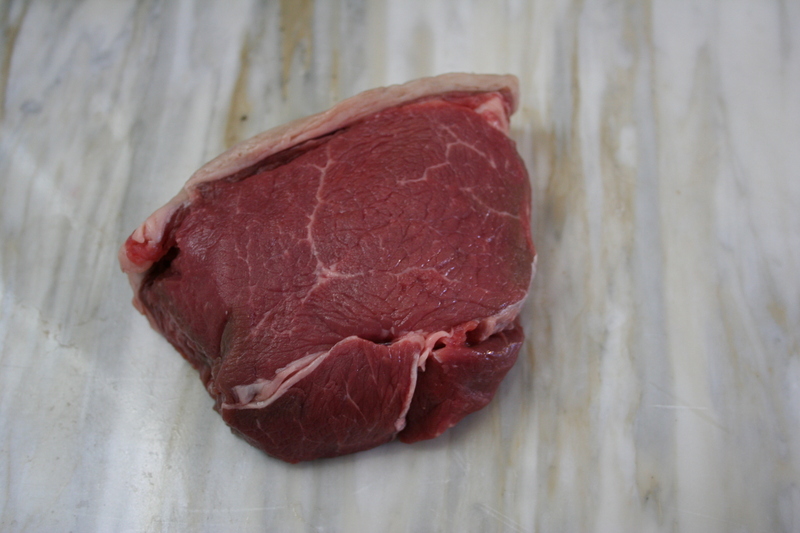 Top sirloin is great because it can be cut into steaks and roasts of varying size, is less expensive than strip steak or rib eye, and is quite lean on the inside with a nice fat cap along the top. This means that you get some of the flavor of the fat, without having to eat all the fat, and picky eaters can cut theirs away more easily. Best of all, in my experience I’ve found that top sirloin has wonderful flavor, equal to that of a strip loin or rib eye. 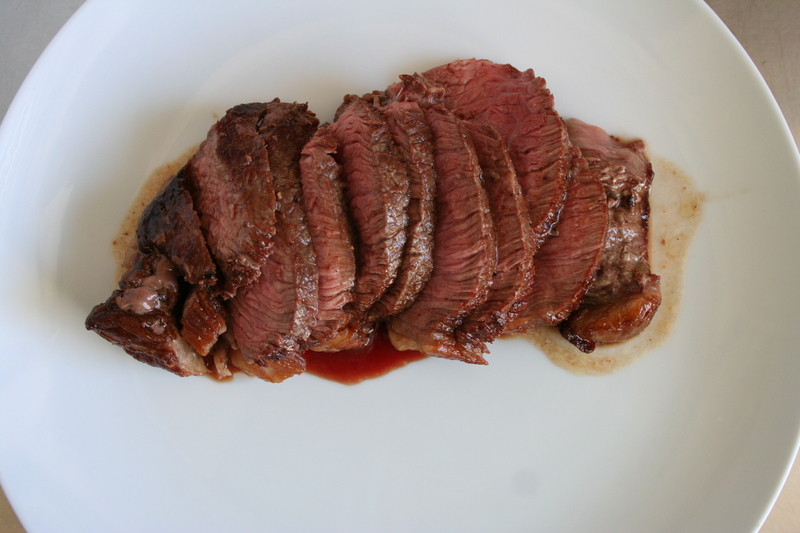 For cooking at home without a grill, a top sirloin is easiest because it sears better in a pan than a bone-in steak. Top sirloin comes from the section of beef just behind the loin and actually rests just underneath (or on top of depending on your view) the hip bone. It is directly adjacent to the part of the animal from which you would get your t-bones, porterhouses, and strip steaks and, as I said, carries a similar flavor profile and texture to those high-cost cuts. 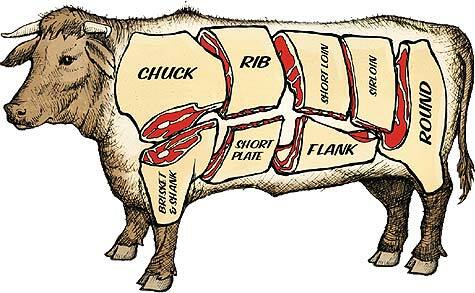 I’m including the diagram below, to help show where the top sirloin is on the animal. Below, I’ve outlined the 12 steps that I think are essential to cooking a great grass-fed or pastured top sirloin steak. I developed these steps over years of cooking grass-fed beef, and I believe that the times and temperatures that I indicate below will yield the best results. 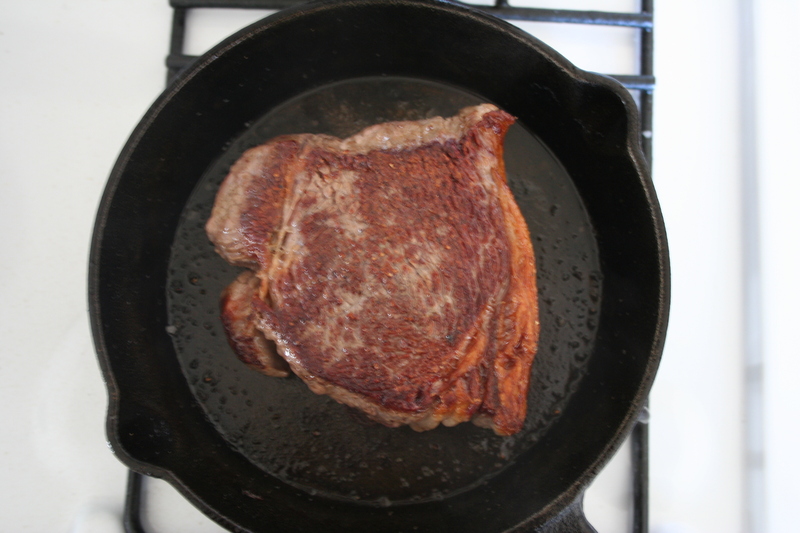 Though you may have read that grass-fed beef must be cooked at a low temperature, the contrary is actually best: starting the meat in a pan over high heat sears the exterior and locks in the moisture, while finishing the cooking in the oven makes it easier not to overcook your steak. (1.) Take your steak out of the packaging and put on a plate or tray to warm up. 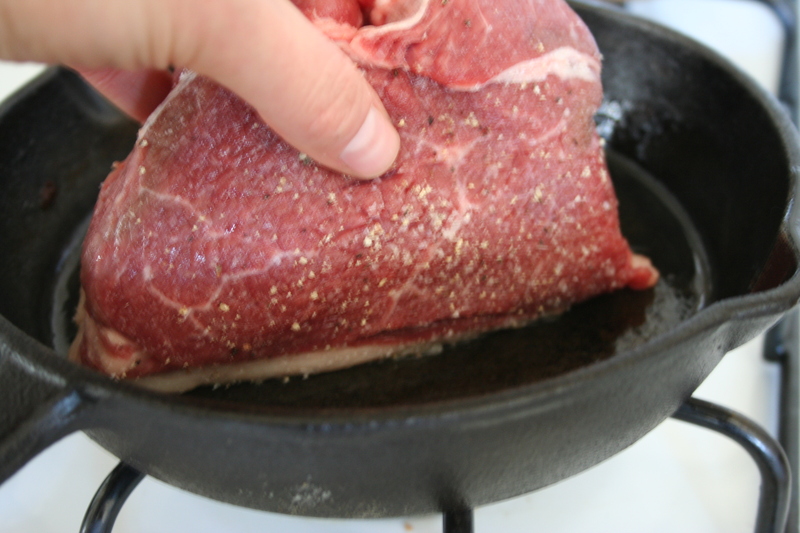 For a 1”-1 ½” thick steak, you should do this 45 minutes to one hour before you plan on cooking. A little while before you plan to start cooking, turn your oven to 350 degrees Fahrenheit. (2.) Get a cast iron skillet very hot. If you don’t have cast iron, use the heaviest pan you have; all-clad would be your next best option. In either case, it’s important that the size of the pan fit the number of steaks that you’re cooking. You don’t want to crowd more than one steak in a small pan, but you also don’t want to cook one small steak in a very large pan. The trick to getting a pan very hot in the right way is to make sure the flame is large enough to cover the bottom of the pan, but not so large that it’s reaching up and around the sides of the pan. Waiting is also key. 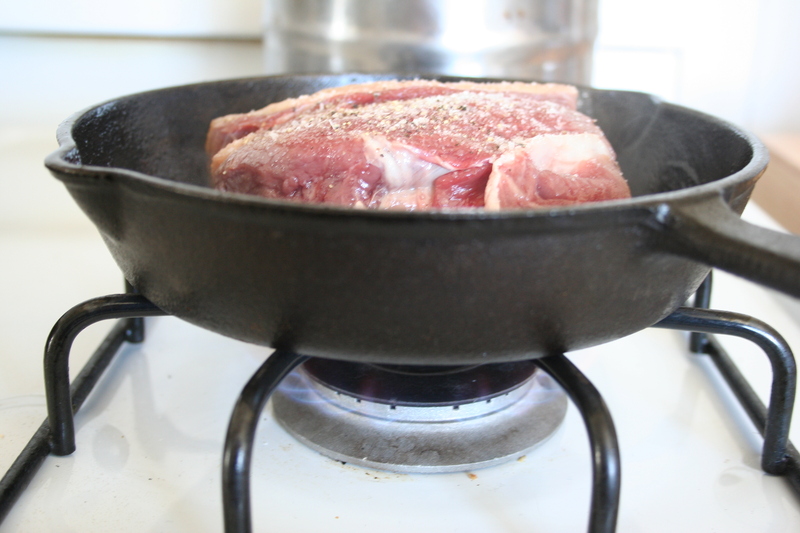 If you have your flame right, the pan will take several minutes to heat up. (3.) Blot your steak well with a clean towel or paper towels. Get as much moisture off the surface as you can. (4.) Put a very thin layer of a high-heat oil like grape seed or canola in your pan. Extra virgin olive oil does not suit this job. By thin, I mean a teaspoon or two. Your steak has fat that we’re going to use, as well. (5.) Check that your pan is hot- you can toss a drop of water on it and see that it sizzles, tilt it to see the oil running very quickly across the surface or, at this point, it may already be smoking so you’re ready to go! (6.) Sprinkle your steak liberally on one side with salt and pepper. It’s better to season with your hand held high above the steak so that the salt disperses more evenly on the surface of the meat. (7.) Place the steak in the pan fat side down first. Hold it there with your hand until it’s well browned and some of the fat has released, 1-2 minutes. (8.) Then, press the salt and peppered side of the steak onto the surface of the pan and allow to cook, turning the pan (not the steak, don’t touch the steak) once every few minutes, until that side is very-well browned. This should take between 4-6 minutes. (9.) Season the other side of the steak. Turn the steak over and allow it to cook on that side for 1-2 minutes. Don’t use a fork to turn the meat; use tongs or, if you don’t have tongs, a spatula. (10.) Put the whole pan in the oven and cook the steak for 12-15 minutes more, until a thermometer inserted into the thickest part of the meat reads 130-135. The temperature will continue to rise a little after you take the steak out. By the way, be careful when you take your steak out of the oven; everyone forgets that the pan’s handle is hot! (11.) If desired, spread a tablespoon or two of room temperature butter onto your resting tray and place the steak on it to rest for 5-10 minutes. (12.) Slice and serve! I like to slice my top sirloin across the grain, vertically, so that each slice gets a little bit of fat on it and my guests can choose to eat that, or cut it away. Pour the butter mixture from the resting tray over the sliced meat.